Jewish Facts From Portland: What Happened to the Jews of Aleppo, Syria ? According to the book of Samuel and Psalm 60, Aram Soba, the Biblical name for Aleppo, was part of the extended area of Israel. Aleppo covered a huge area at this time. Aleppo's history goes back to King David's day of 1010-970 BCE. The Jewish community here was one of the oldest in the world. When the United Nations declared a Partition Plan for Palestine in November 1947, the Middle East went wild. Severe anti-Jewish pogroms took place with many casualties across the whole Arab world. The most violent happened in Aden and Syria. The violence caused a severe increase in a Jewish exodus, with the Aleppo Jewish community declining. The rioters in Aleppo burned the city's Jewish quarter and killed 75 people. After the pogrom, the city[s Jewish population had left. 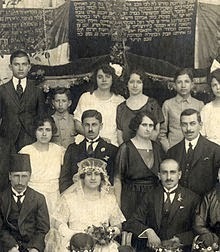 In 1948, there were about 30,000 Jews in Syria. That's not many when you realize that in 2011 the population of Syria was as high as 22,505,000. The Syrian government placed severe restrictions on Jews who might choose to escape. This included emigration. Over the next decades, many Jews managed to escape, and the work of supporters, especially Judy Feld Carr, who helped smuggle Jews out of Syria, brought their plight to the attention of the world and raised awareness of their situation. After the Madrid Conference of 1991, the USA pressured Syria's government to ease its restrictions on Jews. By Passover 1992, the government of Syria began granting exit visas to Jews on condition that they would not go to Israel. 4,000 Jews were living in Damascus called in Arabic "Yehud ash-sham) and Aleppo and Qamishli. Most Jews had made it to the USA and some to Israel already. A few family had chosen to emigrate to France and Turkey. There is a large Syrian Jewish community living in South Brooklyn, New York. A few remained in Damascus. There was a final airlift by Israel that took place in 1994. They took these few to Tel Aviv. "The Syrian Jewish community in New York originally consisted of two groups, Jews from Aleppo and Jews from Damascus, Syria. At first the convergence of the two groups was not easy. The Aleppan Jews thought of themselves as more knowledgeable, largely due to their history in Syria as a center of Jewish learning. The Aleppans, or Halabis , followed the traditions of Aram Soba . The Damascene Jews or shammies , prayed in a different house of worship, although in Brooklyn the two groups lived side by side and socialized." By 2004, the Syrian government tried to establish relations with the emigrants, and a delegation of about 12 Syrian Jews came back and visited Syria in the Spring. The surname of Halabi means Aleppo. It denotes an origin from Aleppo (Halab), Syria, or people who traded with Aleppo residents. A number of different families from different religions used that surname. Muslims, Jews, Christians or Druze might be carrying this surname. Some of the Muslims with the surname of Halabi have migrated away to cities in Western Saudi Arabia such as Jeddah, Madinah and Makkah. Many Halabi Christians have migrated to the USA, England and other European countries. Druze al-Halabi are found in Lebanon, Israel, Canada and the USA among other countries. Halepovich is a variant of the name which is used among slavic Muslims in the Balkans. Najeeb Halaby is the Syrian father of Queen Noor of Jordan who was born as Lisa Najeeb Halaby. Lisa Elhalabi is the Administrator of the Federal Aviation Administration of the USA and the CEO and chairman of Pan Am. ALEPPO in arabic is called. Ḥalab; the Jews of Aleppo called it Aram-Ẓoba or Aram Ẓova), It was the second-largest city in Syria and the center of northern Syria. The legend has it that Abraham pastured his sheep on the mountain of Aleppo and distributed their milk (ḥalav) to the poor on its slopes. Jews settled in Aleppo during the Greek period and remained there during the Roman days. "The community seems to have had close contacts with Palestine, and heads of Palestinian yeshivot (schools that studied the Torah) visited Aleppo." Judea and Samaria were called Palestine after 135CE by the Romans. "At the beginning of the 16th century exiles from Spain started to arrive in Aleppo, among them outstanding rabbis. " It was the Spanish Inquisition of 1492 that drove out the Jews from Spain and then from their refuge, Portugal and caused them to flee to Syria. In Aleppo is the Al-Hayyat mosque. It used to be a synagogue dating from the 6th century. Benjamin of Tudela found 1,500 Jews living there in 1170 CE. Before 1914 there were 14,000 Jews living in Aleppo. The Jewish quarter contained many ancient synagogues with the oldest being the Mustaribaha which was destroyed in 1947's riots. The main part of this synagogue dated back to the 4th century. The New Standard Jewish Encyclopedia "Aleppo"